Monster Beats Tour review | What Hi-Fi? Seems a Premier League footballer can't appear at the post-match interview these days without a pair of Monster's Dr. Dre-endorsed Beats headphones. We were interested to see if these Monster Beats Tours in-ears proved as ubiquitous. The thin red cable may look like a rubber band (or a Fruit Winder, depending on the age of your cultural references) but it certainly does what it's supposed to: prevent itself becoming easily knotted. 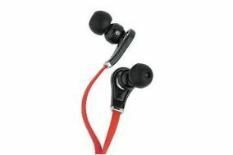 The headphones themselves are sturdily made and, thanks to the four sizes of earbud provided, are comfortable and light to wear. The Tours sound like the sort of headphones Andre Young would be happy to put his (stage) name to. The Roots' Thought @ Work sounds bold and punchy, the jackhammer beat nicely controlled, and there's no shortage of dynamic or drive. The midrange and, to a lesser extent, the upper frequencies attack crisply; there's an immediacy and excitement that few price-comparable alternatives can rival. There's a little coarseness to the way vocals are reproduced, and the overall signature is relentlessly forward which suits some material perfectly. If you're looking for a subtle performance, you probably didn't have these on your shortlist anyway.